David and Eileen Macpherson Wedding? David qualified as a Quantity Surveyor in July 1941, and worked with a firm of Surveyors in Edinburgh. He later worked with the National Coal Board, first in Edinburgh, in the area of miner’s welfare, where he was responsible for a number of pithead baths before moving to London. He was working there during the early part of the Second World War, and lived in rented accommodation near Croydon Station. He was able to visit his brother Robert in nearby Sanderstead quite frequently. After David moved away the house where he had lived was hit by a bomb, and his bedroom was neatly sliced off, with clothes on a hanger on the bedroom door clearly visible. David married Eileen Cassidy on the 3rd May 1941 at Leatherhead, Surrey. His brother Robert gave Eileen away, and Harry was the best man. Eileen worked in the Post Office in London. David joined the Royal Engineers, where he became a Captain. 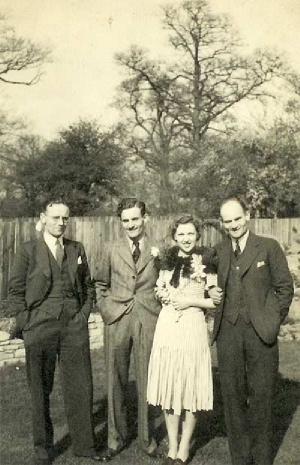 After the War, his father John decided he needed a partner in his business as a manufacturers’ agent, and asked each of his sons in turn, but as Harry and Robert were already established, they declined. David agreed to Join his father, becoming sole partner when his father died in 1961. David was a keen rugby player despite breaking his collar bone twice. The second time it was not set properly, and became delirious, but survived. David and Eileen celebrated their Silver Wedding in Edinburgh, in May 1966, but David was not very well at the time. He had developed cancer, and died in January 1968, at the early age of 53. Extract from” History of a Macpherson Family” – Margaret Hambleton 1987.